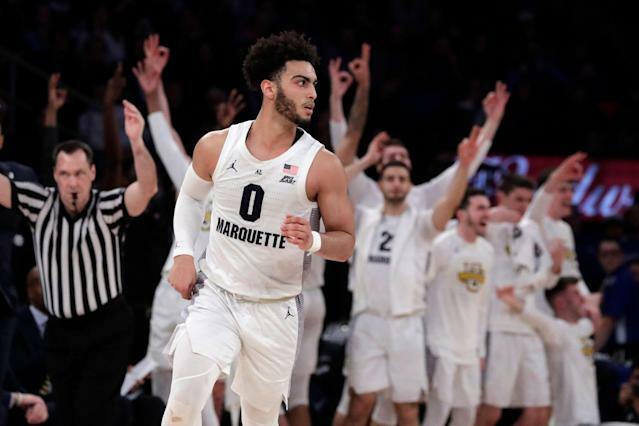 Marquette got a boost on Friday to its hopes of competing for the Final Four next season when Markus Howard announced that he’s returning for his senior season rather than entering the NBA draft. The point guard is one of the college game’s best scorers, who averaged 25 points and 3.9 assists last season en route to Big East Player of the Year honors. His return should firmly put Marquette in the preseason top 10 and give the Golden Eagles a chance to build off a campaign that ended in disappointment when they lost six of their last seven games that included a loss to Ja Morant and Murray State in the first round of the NCAA tournament. Howard is not a sure bet as an NBA prospect with his 5-foot-11, 175-pound frame and less-than efficient scoring. Howard shot 42 percent last season and, at his size, would be a defensive liability at the next level. Another year in college gives him the opportunity to convince NBA scouts he can be an effective role player in the league as a scoring threat.